My friend John was raving about a newer French restaurant, Maison Giraud, in the Pacific Palisades. “You must try their croissants. They’re the talk of the town,” he said. Walking inside to meet him and two friends, I was hypnotized by the glass pastry counter filled with trays of croissant au beurre, pain au chocolate, raisin rolls, apricot Danish and brioches. I made a mental note to ask for one of each to be placed in a bag to take home. John has known the owner and Executive Chef, Alain Giraud’s for years. He pointed to a large photograph of the chef on one of the walls inside the restaurant. “That’s Alain when he was about 8-years-old working at his father’s French restaurant in Coccreze,” he said. 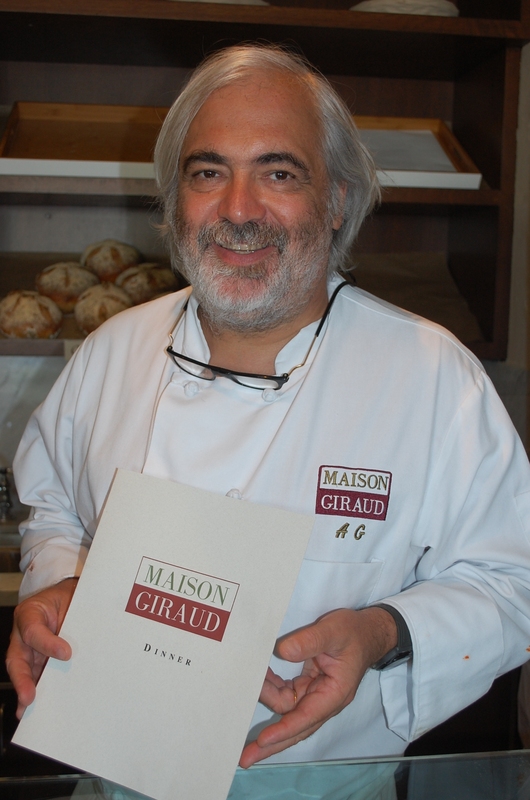 In the photo, Giraud is holding a savory puffed pastry dish. In the late 80s, Giraud left Europe and arrived in Los Angeles to work with the esteemed Michel Ricard at Citrus on Melrose. He went on to teach others to cook and held classes at Citrus, Let’s Get Cooking and Sur La Table. Giraud was invited to be a member of Academia Culinaire de France, The James Beard Foundation and Club Culinaire Francais of California. In 2002, many remember this esteemed chef cooking at Bastide. A few years later, he created Four Stars Private Cuisine, where he cooked exquisite meals in private residences and dining venues. Giraud is a culinary consultant and continues to offer private cooking classes in homes. When the beloved Dante’s Italian restaurant closed last year, Giraud saw an opportunity to open a new French restaurant at that location. The Pacific Palisades Farmers’ Market is located right in front of his restaurant every Sunday. Our server brought small glasses of asparagus soup with a touch of cream and a refreshing glass of melon gazpacho with diced mint, watermelon and cantaloupe balls to our table. A dash of Tabasco gave the soup oomph. The Nicoise salad is a classic with its sliced hardboiled egg, quartered potatoes, cherry tomatoes and tuna dressed lightly with virgin olive oil. To continue reading my review, click on http://parklabreanewsbeverlypress.com/news/2012/09/maison-giraud/. Courtesy of the Beverly Press and Park LaBrea News. Published on 9/13/12.